Let’s talk about Nadia and her father, Hussam. Nadia walks into CRP with a red blazer, stylish blouse, hair loosely pulled back. Her demeanor is quiet and Hussam leans on her arm. She tries not to show her past of struggle and suffering that so often accompanies refugees seeking help at CRP. Nadia’s journey to CRP has been rough. Facing war and religious persecution, Nadia’s family is one of many who have recently fled Iraq. It wasn’t an easy decision. At first her family did not have sufficient funds to leave a war-stricken home. Getting out of war-torn areas is challenging, not just because of the danger, but because the journey itself can be expensive. But Nadia was more concerned for her two sons than anything else. So she finally made the best decision for the future of her children and sold all of the gold and jewelry she possessed. “I chose a future for my two sons instead of the gold,” she says. As a mother, she knew that no amount of money or gold or jewelry was more important than her kids. All of the money they earned from the gold paid for the plane tickets to leave Iraq and come to Amman. Now as a family of six, they live in East Amman and life is not always easy. The cost of living is more expensive here than in Iraq. On top of this, Nadia’s mother is ill, which leaves her incapable of physical exertion. 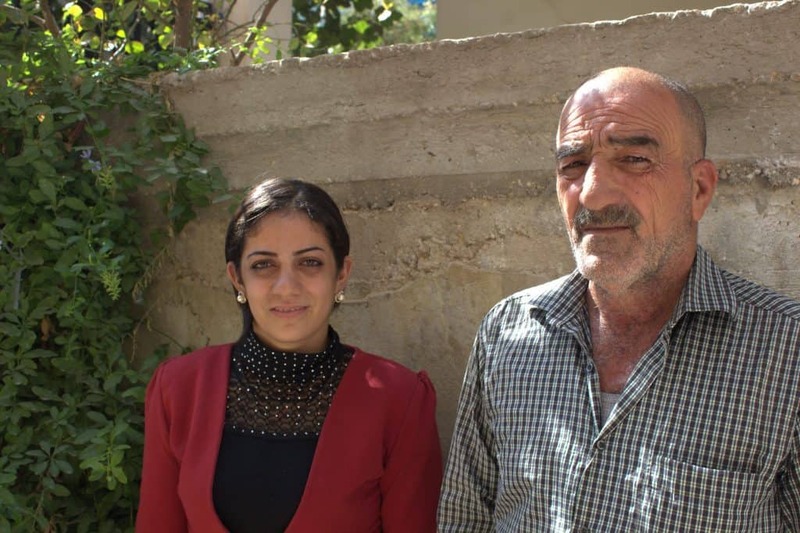 Hussam, Nadia’s elderly father, uses a cane and recently needed to undergo an expensive surgery. At this time, covering medical costs is beyond the scope of CRP’s work, and other organizations have so far denied covering Hussam’s surgery bill. Even with little help from friends and the gold, Nadia’s family did not come with much. Nadia and Hussam dedicate a small portion of their dwindling funds to pay off the bill each month. As these problems loom over Nadia’s head, sparing money for food is a hardship. Nadia explains that receiving food vouchers from CRP helps them save for medical expenses and other bills. But even getting support from CRP was difficult. Because we’re a small grassroots organization, meeting the needs of all of our beneficiaries can be a challenge. CRP conducts rigorous home visits before deciding on which level of support we will give each family, because it is important that we serve those most in need. But this level of detail combined with relying on predominantly on donor support can create a long waitlist of people who need our help. Nadia’s family waited several months before they received help. Over the summer, Nadia and her family received chicken and meat distributions during our Eid-holiday distributions, which they were happy to receive despite not celebrating the Eid holidays. (It is also important to us at CRP that even when we have special holiday-related distributions, the list of recipients remains nonsectarian).